Kitco’s exclusive five piece pure silver bar set contains 50 troy ounces of pure silver bullion, with five different 10 oz silver bars in a wood display box. It contains one each of the silver Ace of Spades, Ace of Clubs, Ace of Diamonds, and Ace of Hearts, as well as a colored silver Joker Girl bar. These unique 10 oz pure silver bullion bars are available only at Kitco. Our artists have created fine silver versions of the four Aces in a deck of cards, plus a Joker. You deserve this winning hand of silver aces and a wild card! Our 10 oz Silver Bars are definitely not just another standard 10 oz silver bar to add to your stack. 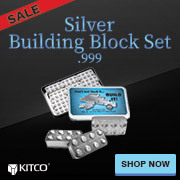 This .999 silver bar set from Kitco is for the person who loves silver bullion, loves silver bars, and who is looking for truly unique set for their collection. Containing five distinct 10 oz silver bars, this set is a collectible silver bullion work of art, and is minted exclusively for Kitco by SMI (Sunshine Mint Inc. of the USA). It contains the first ever use of color in a custom designed silver bar for Kitco. Each exquisite 10 oz .999 silver bar comes encapsulated in an protective acrylic casing. The five bars are displayed together in an elegant wood box. This set would be a perfect gift for the person who has everything. Consider this set as a present for Dad on Father’s Day, or a retirement gift for a valued employee to wish them luck in the future. Going to a Vegas wedding? Here’s a gift that has value and a perfect theme for the wedding party on the Vegas strip. Need a Christmas gift for a poker player or a present for a card lover? This set of silver Ace bars with Joker will really make an impression under the tree this year. All five bars are also available to be purchased individually (Ace of Spades, Ace of Hearts, Ace of Diamonds, Ace of Clubs, Joker Girl). Individually sold 10 oz silver Ace bars and the 10 oz Joker Girl bar come packaged in acrylic capsules surrounded by a decorative paperboard sleeve of black and gold. Don’t miss out on this beautiful 10 oz Silver Bar Five Piece set! With its detailed design and limited quantity, Kitco's exclusive 10 oz Silver Bar Five Piece Set - 4 Aces + Joker Girl is a great addition to your silver collection. Why buy 10 oz Silver Bar Five Piece Set- 4 Aces + Joker Girl from Kitco?